Love Rainbow Magic? Meet these tiny talking fluffies. New and very cute from Daisy Meadows, with bonus puzzle pages. Just gorgeous. Tra-la-la! We’re sooo excited. Daisy is back. Even better, her new series lets you indulge in magic and get a massive cute fix of cuddly animals. How lovely is that? 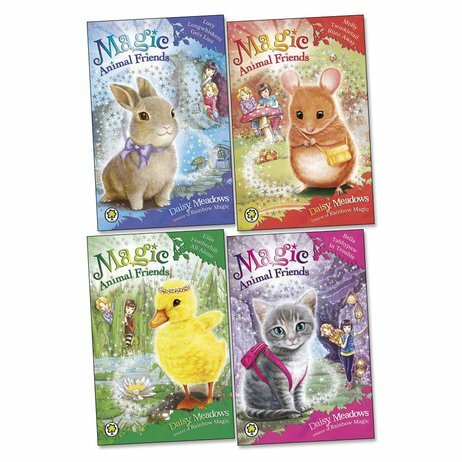 Take a trip to Friendship Forest, home of the Magic Animal Friends. Visit their tiny cottages, solve magical mysteries and sip tea at the Toadstool Cafe. This book has amazing adventures. Lily and Jess try to help their little friends defeat Grizilda and her bogits. Grizilda is despicable.